Skoda is the well known carmaker in India and to target more of the youths under its hat it had rolled out Rapid in our market, but on a competitive horizon there lies a lucrative strategy where most of the sales are cash due to new inventions either on the metal or its purchasing convenience, here the Czech carmaker goes with the latter one, so expecting a whopping number to flung out from this new numeric game plan. Just recently it also has introduced some of the schemes, inclusive of a new TVC as well, but that doesn’t seems to be working out very efficiently, therefore this time now it has given the 100% finance scheme on Rapid, where one can avail this benefit only for a limited period, and to be specific, for the tinting start of summer itself. Coming more clearly to the point, it is revealed, this offer is valid till 18th April 2013, since only a week from now. In addition to the 100% loan scheme on ex-showroom price, customers will also be bestowed with low interest options; henceforth we say that automaker is really luring all the Indian fan base, missing out this opportunity may not lend you on another one, not at least in this season. The brainchild behind this workout is SKODA Finance, a brand of Volkswagen Finance Private Limited, and had made available across all the dealerships of India. 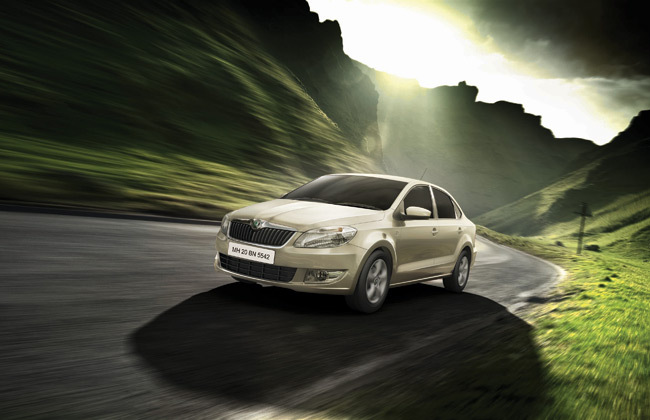 So guys, just rush to your nearest Skoda showroom for beating this summer with new Rapid; and please don’t wait a minute!